This is a very rare and unusual reclining chair. It is most likely French and dates from the 19th Century. At present is is a calico state as in the picture and we intend to upholster it soon in leather. A unique feature is that 2 iron bars can be pulled out of the arms so that a gentleman can rest his weary feet on the rests without taking his boots off. A most civilised chair. Every country gentleman should have one.It is of large proportions. The measurements are approximate but any one with a large country estate should not have to worry about the size of this chair. 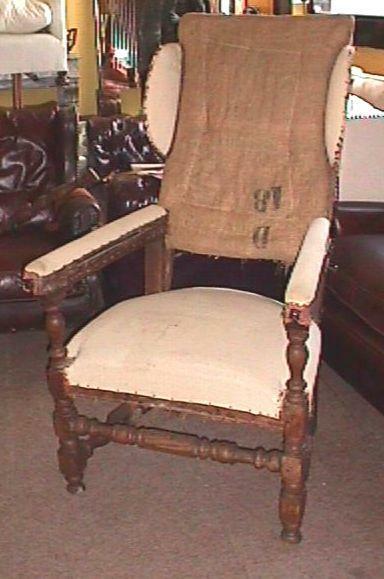 I have been dealing in antiques for over 25 years and have never come across a chair like this.